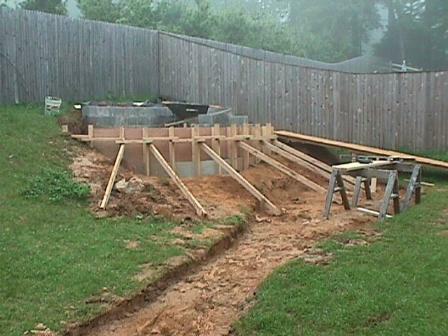 The pictures in this gallery show the progress of the back yard from year to year. Construction started in June, 1998. Working from the natural slope of the land, the swale at the low point was excavated to form the gravel river. 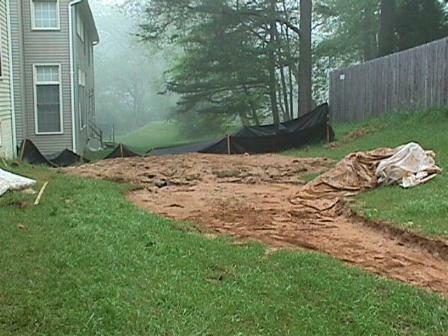 Eventually, a drain was placed at the lower end of the excavated area, carrying rainwater another 20 feet downhill to the property line. On the uphill corner opposite the house, forms were constructed for the concrete footings for the stone terrace. This is the somewhat idealized artist's rendering. 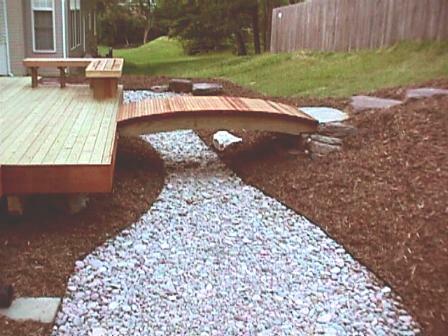 The main elements at this stage of the design are the deck, bridge, terrace, gravel river, and pergola. Later on, the grassy slopes towards the foreground of this picture were terraced and planted. No grass remains today. The finished deck and bridge on July 1, 1998. 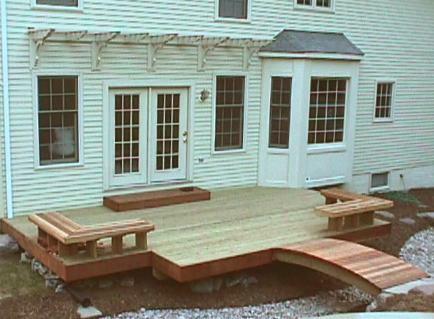 The trim is redwood, and the decking is narrow pressure-treated pine. The gravel is Canadian river rock, held in place with metal edging. The path was constructed of Pennsylvania fieldstone.